Added on January 18, 2013 by ROSEGALLERY. Brassaï had Paris. Weegee had New York. Mark Cohen, well, he has Wilkes-Barre. He has lived in the down-on-its-luck small city in northeast Pennsylvania for 69 years — his entire life. He started taking pictures of car wrecks for the local newspaper while he was in high school and ran a photo studio from his house for more than 35 years. In between the weddings, portraits and commercial assignments — on which he raised a family — he shot quirky street images for his own pleasure. The photos were relentlessly sad, often disturbing. He was not interested in documenting, but in making images that were “a psychological imprint” of what he was looking at. Holding a little Vivitar flash in one hand and his Leica in the other, he waded right into his photographs, running up to people and photographing them from a few feet away. 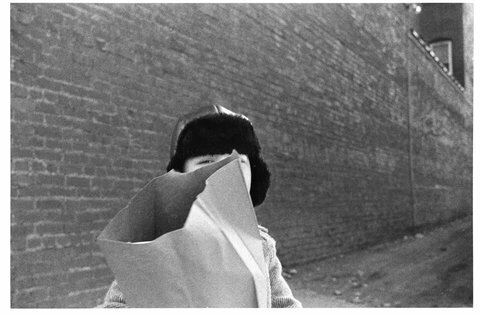 Mark Cohen, Boy and Bag, 1974. It’s an approach that’s been replicated by other street photographers, but under much different circumstances. His habit of approaching unsuspecting subjects has led to altercations, including a few that turned physical. More than once, while making a detail of someone’s clothing with his 28 mm lens, he has been called a pervert. In the fairy-tale version of his life, he might have gone on to move into a SoHo loft, hobnob with artists and become a luminary in the photography world while continuing to produce innovative work. He had to support a family, and there was not much of a market — or money — for street photography. He recalls exhibits where his prints sold for $75, next to photos by Harry Callahan selling for $150. So he stayed where he was and produced his personal work between weddings and portraits. Wilkes-Barre may not have been the best place to be an art photographer, but it turned out to be a pretty good place to develop his personal work. Mark Cohen, Bare Thin Arms and Aluminum Siding, 1981. There are many street photographers in big-city galleries showing images from Manhattan or Paris. But Mr. Cohen has Wilkes-Barre all to himself. Though he insists that his photos are not documentary, the Rust Belt city and two nearby counties have been a perfect canvas for his upsetting imagery. And while Mr. Cohen is not a household name in photography, he has a small, devoted following. His book, “Grim Street,” published in 2005 by powerHouse Books, has become a cult classic among street photographers. In the last decade his prints started selling — for much more than $75 — in galleries in New York and Los Angeles. He has closed his commercial business and is concentrating on his personal work. He lives in a 4,000-square-foot house and now feels that staying put allowed him to produce better work. Mark CohenBreasts, Lips, Hair, 1973. Text courtesy of the New York Times Lens Blog.